Cloisonné Enamel artist Natia Malazonia creates one-of-a-kind pieces of art in the traditional technique of her native Tbilisi, Georgia. 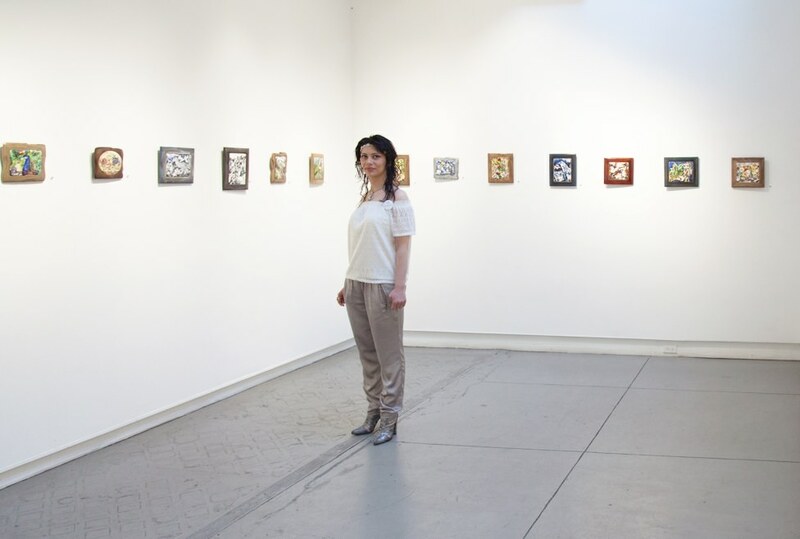 We had the opportunity to speak with Natia and learn more about how she has managed to bring an ancient art into the modern age. How did you get involved in fine art? I’ve been interested in fine arts from a really young age. I decided to be an artist after I finished my secondary education studying textiles, and my interest and passion have just grown stronger since then. Do you think your background in textile design and interest in archaeology play a role in your enamel works? My experience with textile design has played a huge role. I love archaeology a lot, and probably, it does influence the way I perceive things around me. Can you briefly describe the traditional technique that you use? 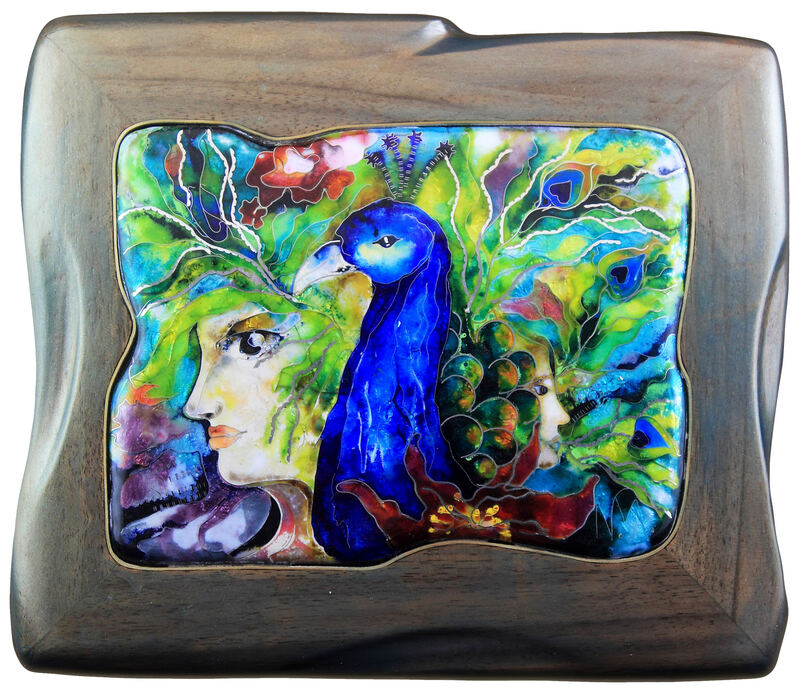 Cloisonné enamel work is the result of a complicated technological process that has not changed since ancient times. I attach thin metal partitions to a metal plate according to a previously designed pattern and fire it in a special oven for a certain period of time at 720-850 degrees Celsius (1328-1564 Fahrenheit). After cooling, I fill the partitions with colors and fired them again. The colors die down consequently and I add more colors in the partitions. 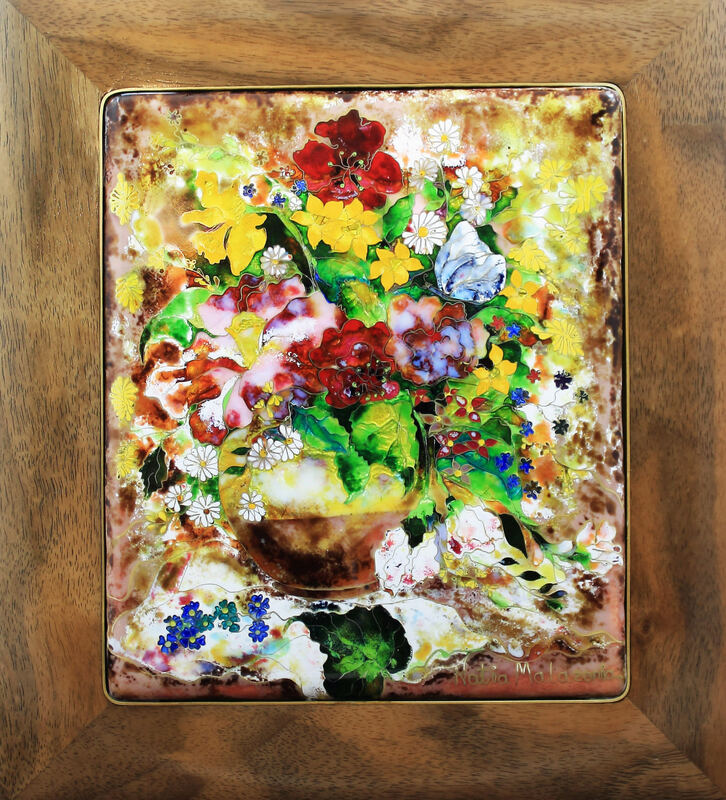 Different temperatures are used for different layers of colors and the work is fired several times. The final stage is polishing; only after this, the work acquires its final shape. Your biggest inspiration in creating these pieces is the Khakhuli Triptych. Can you tell our readers more about what that is and how it inspired you? Detail of the Khakhuli triptych. Image: Wikipedia. Yes, I am greatly influenced by the Khakhuli Triptych and by the impressive and unique cloisonné enamel technique. The Khakhuli triptych is an exceptional example of the golden age of Georgian history and culture, representing the era of opulence and grandeur. 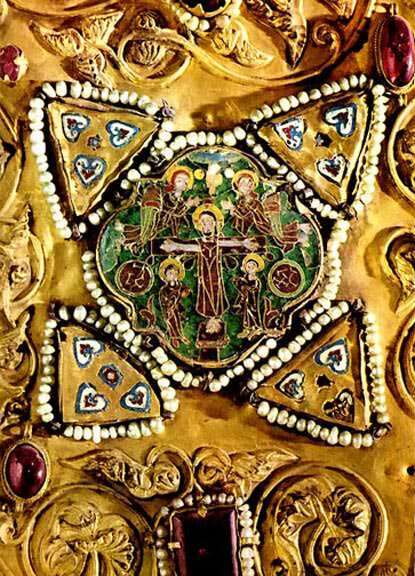 The lockets (115 medallions) on the triptych are small, except for the central image of the Virgin Mary, which is very badly damaged (except the hands and face of the saint). Furthermore, the Khakhuli triptych is the greatest example of enamel (116 cm x 95 cm) in our history. 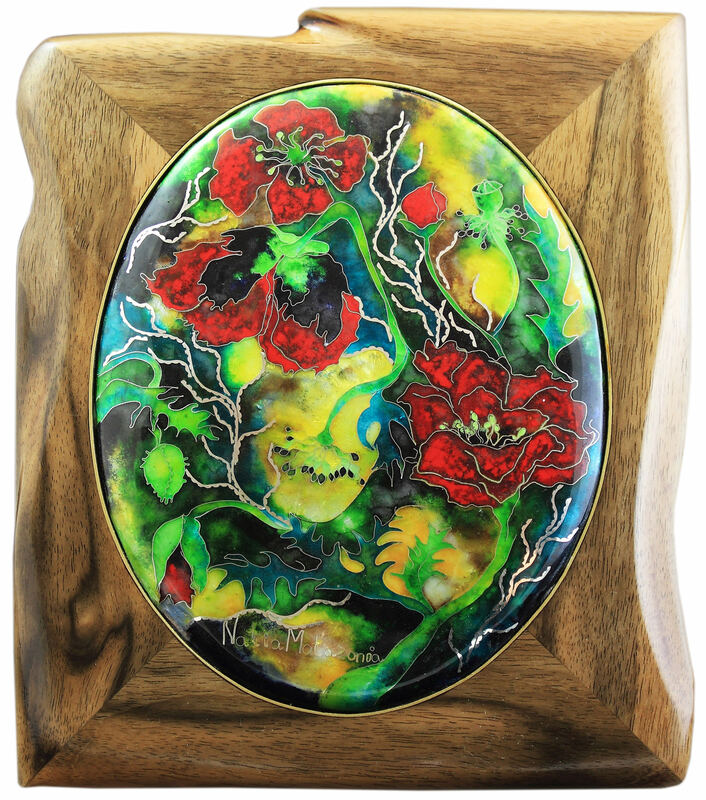 Your enamel artworks are incredibly unique. Could you give us a basic overview of your particular style? I don’t think that my artwork could be characterized as a particular style. The most important aspect of my artwork is composition, and the more decorative part is based on my imagination and my emotional spectrum. 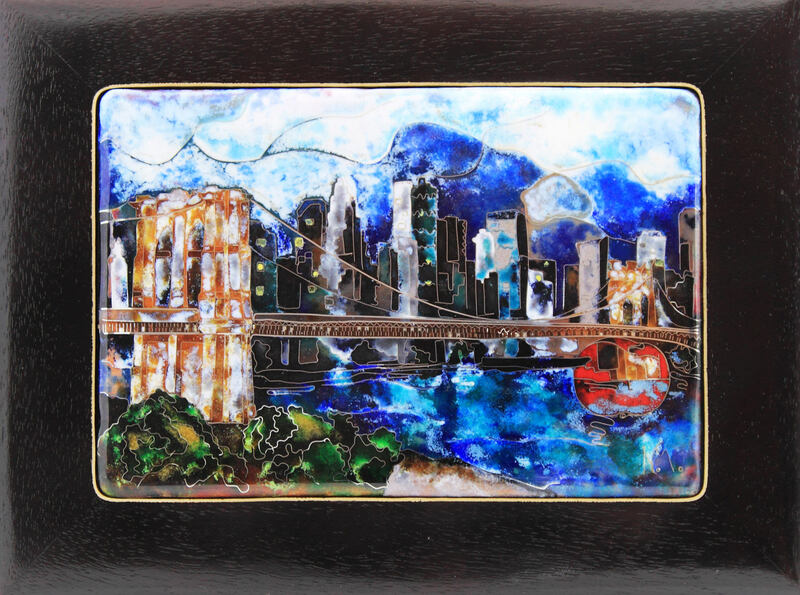 I would say that my personal style unites painting and the techniques of enamel. How have you brought enamel into the contemporary art world? 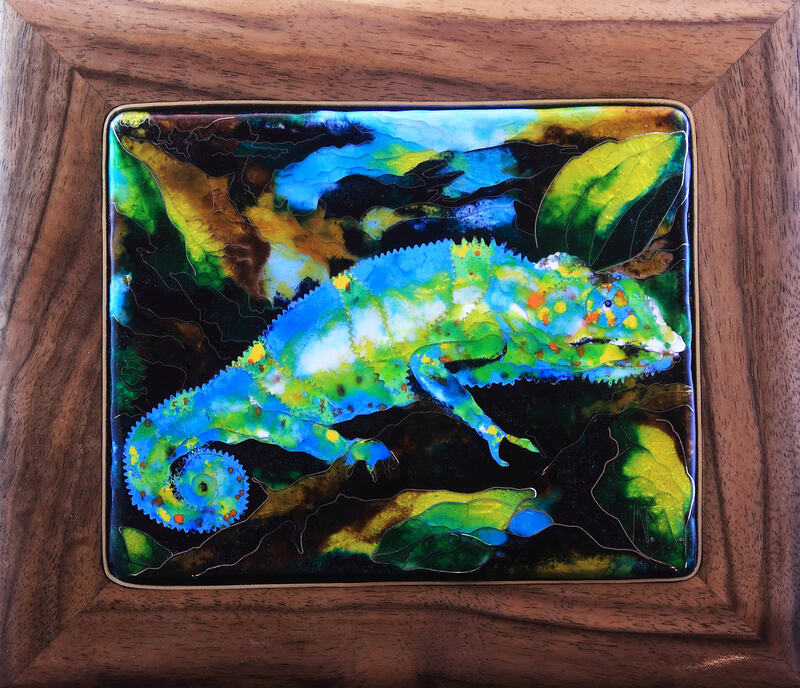 What differences do you see between your work and the traditional works in cloisonné? Art is a medium through which I express everything that I see around me and everything that I feel and experience. I believe that my decision to create emotionally-inclined works is what moved my work from the traditional into the contemporary. However, when you love your home country and appreciate its traditions, you are influenced in one way or another by its traditions. 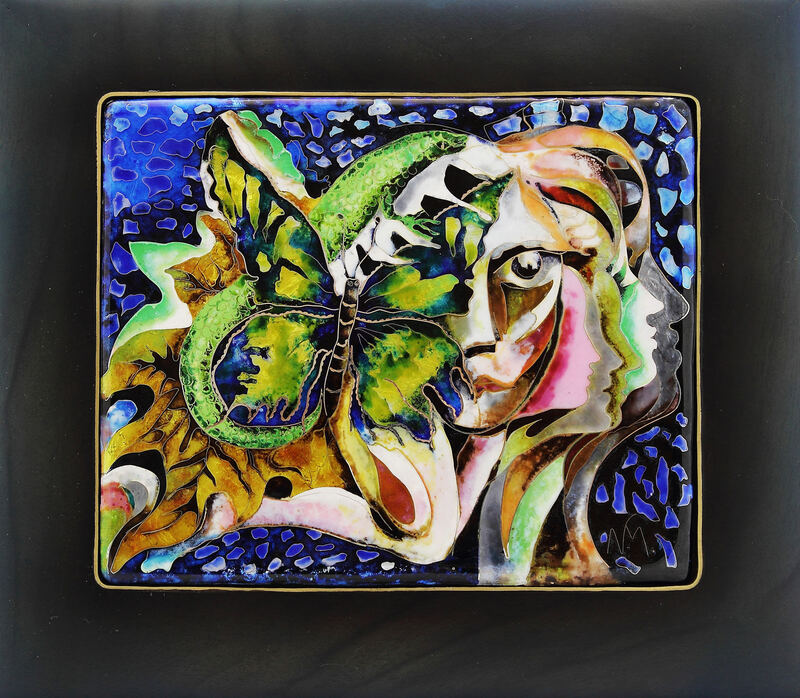 Would you say your pieces are more contemporary art than traditional enamel, or a combination of both? My artwork definitely belongs to contemporary art. Although traditional technology is the basis of the technique, everything else that I do is pretty contemporary. I have developed an individual style over time. However, I still rely on traditional technique while working on cloisonné enamel. At each stage of the process, I gain new, invaluable experience. How do you decide which subjects to portray? I don’t always know beforehand what I want to portray. Often, ideas come to my mind during the process. However, there are cases when I see with my mind’s eye everything that I want to create. The colors in your works are also quite vibrant. How and why do you decide on a particular color scheme? I am going to be repetitive, but I want to emphasize that the colors depend on my emotions and state of mind. It all depends on my mood and on the music that I am listening to at the moment. I might have an outline of the composition before I start working, but everything might change during the process. I am more spontaneous in that regard. To learn more about Natia, visit her Agora Gallery Artist Profile. To purchase her original artworks, check out her ARTmine page.